On Monday, Grammy-winner Chance the Rapper announced a $1 million donation to Chicago Public Schools, just as Gov. Bruce Rauner’s office presented new ideas to rescue the cash-strapped district from its funding wreckage. The governor’s office says there are a couple of ways for Chicago Public Schools to fill its budget hole. In a memo, the governor’s Chief of Staff Richard Goldberg suggested two options. One of them is to use tax-increment financing dollars. Goldberg says the office is already drafting legislation to that end, just in case. The memo also recommends using TIF dollars as a long-term solution for CPS – an idea that’s been floated before. “I think when we look at TIF districts across the state, we see that there are many TIF districts that actually allow taxation for educational programming, and I think that’s something that was discussed at the Illinois School Funding Commission. So I think it’s worth looking into further,” said Illinois Secretary of Education Beth Purvis. The memo cites that the district has already received a $102-million increase in general state aid this year, along with the $250 million CPS receives through special block grants. The other suggestion: Add CPS’s $215 million request to Senate President John Cullerton’s statewide pension reform legislation, Senate Bill 16. That’s how CPS was originally promised this $215 million for pensions. The agreement was that CPS would receive it only if the state passed broader pension reform. The governor vetoed the funding bill for CPS last fall, when pension reform hadn’t happened yet. The memo says SB 16 could be untied from the so-called “grand bargain” – passed through the General Assembly and signed on its own. Both the mayor’s office and CPS responded to the suggestions in separate statements, but both argue that the state is asking Chicago taxpayers and students to work harder or pay more for what they believe they’re already owed. 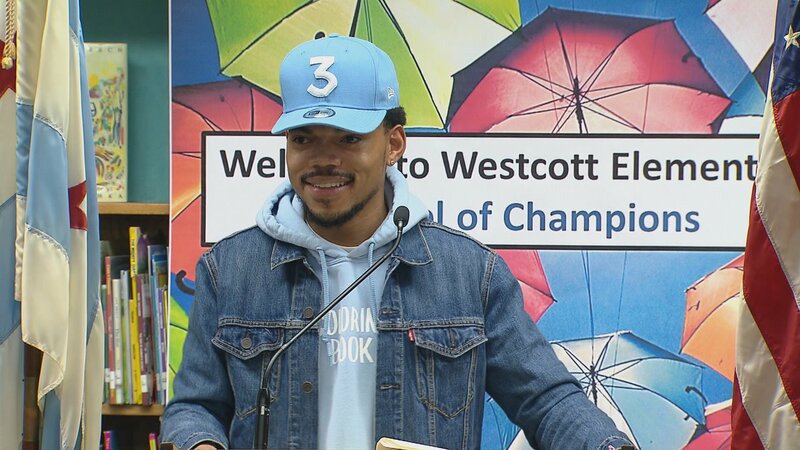 Chance the Rapper held a press conference Monday at Westcott Elementary School in the Auburn-Gresham neighborhood where he announced that he’s collaborated with ticketing corporations like Live Nation and Ticketmaster to donate $1 million to Chicago Public Schools for arts and enrichment – from the ticket sales for his upcoming tour. Not only did he meet with Rauner last Friday, they also spoke by phone over the weekend. But still, the rapper says the governor is being vague and non-committal. In addition to the $1 million donation that’s coming from his youth-focused nonprofit, Social Works, the CPS grad is asking the governor to do his job. Chance says he’s challenging other major corporations to join him in donating to CPS. He and his nonprofit are also planning to donate an additional $10,000 to a CPS school for every additional $100,000 raised. He started that Monday by donating $10,000 to Westcott Elementary. The governor’s office also notes the Rauners themselves, through their family foundation, have donated $7 million in the past 20 years to organizations that support public education. March 3: Fresh off of his Grammy glory, Chicago’s 23-year-old Chance the Rapper used his celeb status to score a private meeting Friday with Illinois Gov. Bruce Rauner to discuss Chicago Public Schools. March 2: A report released this week by the Chicago Urban League shows minority students in the state are still as likely to attend a racially segregated school today as they would have been 60 years ago. Feb. 27: Chicago Public Schools students could be in for a shorter school year.